Nearly 40 years ago that old warhorse for the protection of the American Public from spoiled and poisonous food and drugs (the late Dr. Harvey W. Wiley) had a fine law enacted for this purpose. But the Drug Trust got its hooks into the government bureau which was charged with enforcing the law soon after Dr. Wiley's death. This Bureau — now known as the Food & Drug Administration — is used primarily for the perversion of justice by "cracking down" on all who endanger the profits of the Drug Trust. The Bureau occasionally prosecutes, on its own initiative, smalltime opportunists who should be prosecuted. Thus in a few small cases the Bureau does good work. Its principal activities, however, are as servants of the Drug Trust. Not only does the F&DA wink at violations by the Drug Trust (such as the mass murders in the ginger jake and sulfathiozole cases) but it is very assiduous in putting out of business any and all vendors of therapeutic devices which increase the health incidence of the public and thus decrease the profit incidence of the Drug Trust. When the F&DA, whose officials all have to be acceptable to Rockefeller Center before they are appointed, receive orders to destroy an independent operator it goes all out to carry out these orders. The orders do not come from Standard Oil or a drug house director. The American Medical Association is the front for the Drug Trust. The AMA furnishes the quack doctors to "testify" that, while they often know nothing of the product involved, it is their opinion that it has no therapeutic value. ''In researching Thorsen's involvement with the CDC, Grundvig came across other instances of malfeasance. In 1984, Coleen Boyle was a principal investigator for the CDC, charged with investigating the effects of Agent Orange. Today, Boyle is the director of the National Center on Birth Defects and Developmental Disabilities (NCBDDD), an arm of the CDC. In the 1980s, the CDC was given extensive information from the army on Operation Ranch Hand about the flight patterns of Agent Orange. The information was archived in Pennsylvania, but the CDC refused to go to the archives and look at it. Doing so meant they'd have to face the truth about the contamination of U.S. troops — about half a million American veterans who suffer from cancers and other diseases caused by Agent Orange. The CDC basically gave up on the Agent Orange studies saying they "couldn't figure it out," when in fact they could have, had they simply gone to Pennsylvania. In so doing, they forfeited $21 million in research money, which in and of itself raises questions about motives. Apparently they deemed the loss of $21 million to be preferable to what they might find by doing the research. "The 101st Congress came out [with a report in 1990 and called it [the] "Agent Orange cover up" to basically skewer the CDC. Unfortunately, nothing happened. They didn't fire the people in charge. 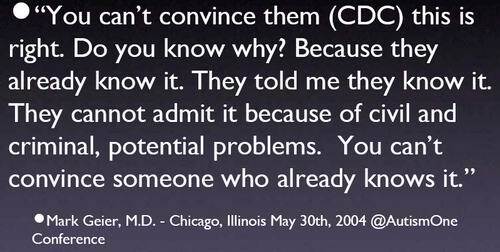 They didn't clean house in the CDC. Once those people at the top were able to get away with this, they felt emboldened. They also had a template for future issues like Ebola and Zika," Grundvig says. "The Centers for Disease Control has had three major programs through which it can make diseases appear infectious and make everyone step in line to agree. One is that in the early 1950s they formed a special unit, an elite, semi-secret unit, that is now almost fully secret, called the Epidemic Intelligence Service (EIS). New graduates of medical schools, or biological graduate schools, or perhaps dental schools, or a few other things, public health departments, are recruited upon graduation to take a several-week course, and then dispatched on two-year active assignment, paid by the CDC, in various local and state health departments to become the eyes and ears of the CDC—an invisible intelligence network that watches for the tiniest clusters of disease, and, when the CDC deems appropriate, turns them into national emergencies. We saw this kind of cynical manipulation in the 1957 Asian flu epidemic. We saw it in the 1960s with clusters of leukemia, which they tried to make appear infectious. We saw that with the swine flu epidemic that never materialized, in 1976, and with the Legionnaire's epidemic that same year. And we've seen it more recently with Lyme disease, with Hantavirus pneumonia, and just one thing after another. We have no faith in the integrity of the CDC and the FDA. They are doing all they can to protect themselves and Big Pharma from the truth; that the autism epidemic is caused by Big Pharma's greed and the failure of the CDC and the FDA to do their jobs. Big Pharma must not be allowed to evade its financial liability for the damage their vaccines have caused. Like the tobacco companies in the last century, which kept denying the cigarette-lung cancer link, the drug companies are lying, with the help of the CDC and FDA, about the role of vaccines in causing the autism's epidemic. When the lung cancer cases finally got to court, the truth came out. We parents insist on our right to hold the drug companies liable, in court, for the harm they have caused. The matter must be decided fairly in the legal system, and not by loophole riders exonerating the drug companies that have been added to appropriation bills in the dark of night. The drug companies caused the autism epidemic and they, not the parents nor the public, must pay the costs. They are guilty, they are very profitable and can and should be held accountable. [3/2006] A message from Bernard Rimland, Ph.D.
"When I look at it," Fisher says, "what I see is allopathic medicine at war with the other modalities. Homeopathy, naturopathy, chiropractic are perceived as challenging the basic premise of allopathic medicine, which is that germs are the ultimate cause of illness and must be destroyed--in this case, by vaccines.....Both Fisher and Coulter agree that not only are vaccines the sacred cow of the public health system, they have also become the golden calf. What that means is money. Fisher points out that the Department of Health and Human Services (HHS), with an annual budget of around $360 billion, is the most powerful and wealthiest federal agency in the country. .....In the United States there are two main vaccine policy-making groups, the Advisory Committee of Immunization Practices (ACIP) and the Centers for Disease Control (CDC) under HHS. ACIP makes recommendations for vaccine policy. Fisher says these recommendations turn into mandates "because state health officials automatically turn them into state law. In most states," she says, "[when it comes to public health] you no longer even have a vote by the legislature. All the state health departments have to do is issue a regulation, and it automatically becomes a law." "In addition, the U.S. Office of Technology, one of the few semi-reliable agencies of the U.S. government, says there is no current system utilized by the CDC to determine if the vaccines do work or how dangerous they really are." --Dr Douglass M.D.